Clovis Washer Repair provides high-quality appliance repair. Our skilled and professionally trained techs will repair any problem that your washer has. Today washers are important in every household. We use our skills and experience to provide our customers with excellent appliance repair. Are you living in Clovis, CA? Do you have a washer that doesn’t work properly? If yes, then Washer Repair Clovis, CA can help you. Our professional techs will repair your washers’ problem in one day. If you are interested then dial 559 960 0798 and ask for Clovis Washer Repair. What problems can be repaired by Clovis Washer Repair? 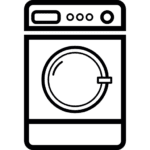 If the problem of your washer was not mentioned above, do not hesitate to call Clovis Washer Repair and ask whether we can repair your washers’ problem. Our technicians will troubleshoot, diagnose and repair your dryer without wasting your and our precious time. Clovis Washer Repair uses factory replacement parts to repair your washer. All of the replaced washer parts have a 3-year warranty. Clovis Washer Repair specialists can replace every non-working part. Some brands, which are repaired by Clovis Washer, are mentioned in the following list. If you cannot find the brand of your washer in the list above, you can always dial Washer Repair Clovis, CA and ask if we can repair your washer. If you are not sure why Clovis Washer Repair is the best, here are some reasons to support it.